Once known as ‘The Science Guy’ Bill Nye is now here to ‘Save the World.’ His new talkshow, according to Netflix, sounds a bit like Comedy Central’s ‘The Daily Show’ with Nye subbing for Trevor Noah and science taking the focus away from politics and pop culture. Each episode will tackle a topic from a scientific point of view, dispelling myths, and refuting anti-scientific claims that may be espoused by politicians, religious leaders or titans of industry. So, basically the opposite of a Trump speech. Nye, you may remember, starred in a PBS-syndicated educational program called ‘Bill Nye the Science Guy’ from 1993 to 1998. The show essentially took over where ‘Mr. Wizard’ left off for the previous generation. Both shows were designed to bring an approachable feel to often advanced topics in science and engineering. 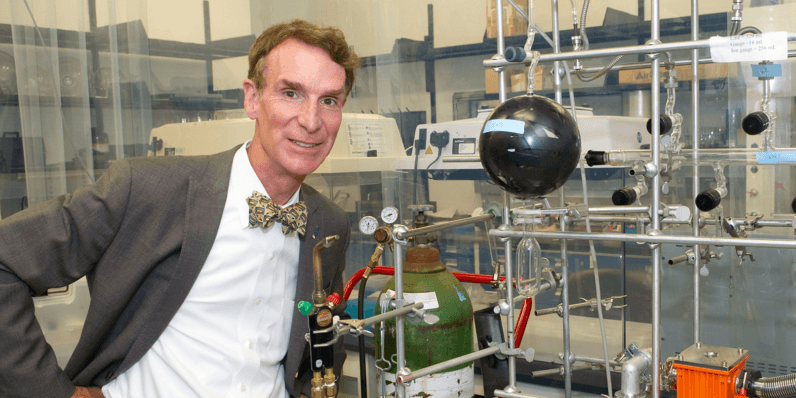 “Since the start of the Science Guy show, I’ve been on a mission to change the world by getting people everywhere excited about the fundamental ideas in science,” said Nye in a statement. Netflix promises the show will feature an unfiltered Nye along with experiments, special guests and scientific demonstrations. It’s set to premiere Spring 2017, exclusively on Netflix.